The best travel tip I ever received was to sleep on flights to Europe and stay awake on the way home. Then, once landed, stay on the destination’s schedule. If you land in London at noon, for example, stay awake until bedtime – even if it means propping your eyes open with toothpicks. Jetlag is more quickly overcome this way. My English friends know this technique and always help us adjust to their time zone by coming up with a Landing Day activity when we visit. The idea is that we will be so captivated by our experience that we are simply too excited to sleep. Most recently they surprised us with a visit to Brooklands, the birthplace of British motorsport and aviation. Built in 1907, Brooklands was an extremely modern track with intentionally-banked curves on which British motor sports advancements were showcased until World War II closed down racing in 1939. Aviators, however, had descended upon the track in 1908 and made it into a dual-purpose track and aerodrome. From here pilots were trained and aircraft produced through both world wars and beyond. 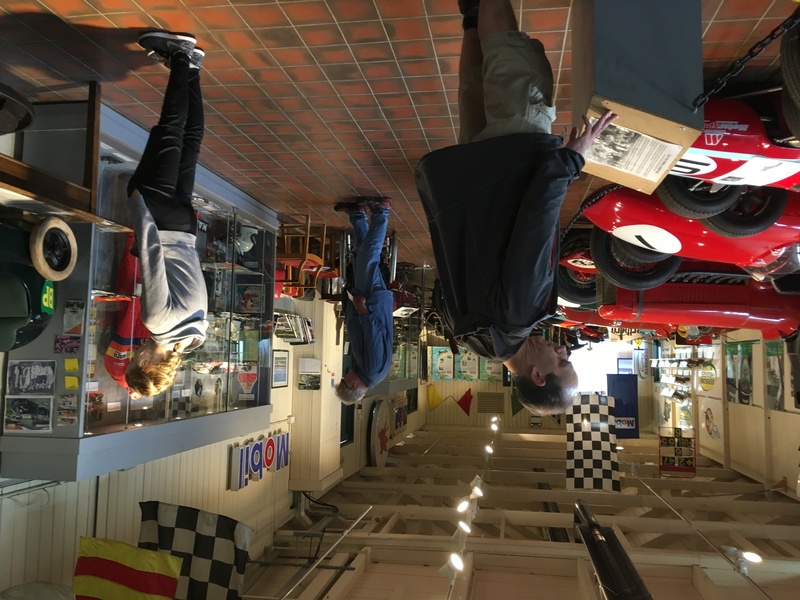 Visitors walk through British Motorsports history in Brooklands Museum. 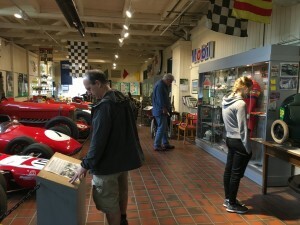 We entered through a gift shop in one of several buildings in what was once a paddock area. Another building was home to original Grand Prix cars along with the gear maintained them. These were the fastest and most cutting-edge autos of their time. Historical documents, clothes, artifacts, flags and maps adorned the rooms. Moving on, we found vintage motorcycles and bicycles that had been raced on the Brooklands circuit. A volunteer explained that it is his job to polish up the motorcycles for weekend drivers and visitors. In this room were also shiny gold and silver trophy cups of all sizes commemorating records that had been broken at Brooklands. It is possible to don goggles and step into one of the cars at the property’s 4-D theater to relive a race from the 1930s with full motion, sights, sounds and smells that would have been a part of the experience. The theater also offers a 3-D film of the British Red Arrows flight squad and a 2-D film of the Le Mans circuit. There is much to take in at historical Brooklands Museum just outside London, England. 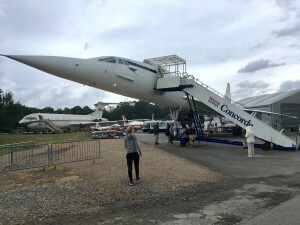 Outside, we turned a corner to find a field full of airliners that had been built at Brooklands’ aircraft manufacturing facilities – including a Concorde. This was the birthplace of the SST in partnership with France. Interestingly, the British half had been built with imperial measurements and the French with metric. Miraculously, the two halves came together in the world’s first supersonic passenger airliner. We toured the plane and sat in passenger seats for a simulated flight experience. After our walk-through, we visited the Concorde’s flight simulator where pilots had been trained. It was originally off-site and full-motion, but when it was relocated to Brooklands, the movers unceremoniously cut it in two, rendering it useless. Fortunately, engineering students meticulously reconnected every wire, and it is now open for visitors who can see what the cockpit was like when the nose of this supersonic bird dropped for landing. A rare walk beneath the supersonic Concorde. We toured the Vickers VC10 that had belonged to the Sultan of Oman with its gold velvet seats and luxurious sleeping quarters, and we peeked in the tiny shack that became the first air passenger ticket booth in the world when it sold a ticket in 1911. Other firsts that happened in the early 1900s at Brooklands include the first British air show and the licensing of the first British woman pilot. Bombed in 1940, it largely survived the war and continued on as one of the most important aircraft production facilities in Britain, with more than 18,000 airplanes of 250 types being built on-site. Many of the facilities at Brooklands are indoors, a lovely feature for an often-rainy climate. The centrally located café sits in the shadow of the large building that is home to a post-WWII Stratosphere Chamber where aircraft were tested to conditions that simulated those found as high as 70,000 feet, the expected altitude for Cold War-era aircraft being developed on the field. In the same building were scattered myriad aircraft engines and various types of bombs used in WWII with docents available to explain everything. In another hangar we walked around the Wellington Bomber, a WWII airplane on an ill-fated training mission that had been lost in Scotland’s Loch Ness during a blizzard on New Year’s Eve, 1940. The aircraft was found and resurrected in 1985 and is now being meticulously rebuilt by volunteers at Brooklands. From where we stood, we could see the controls used by the pilots and gunners and imagine them at their dangerous work. Stepping even farther back in time, the Vimey Pavilion is home to replica airplanes from the early 1900s. One such aircraft, the Roe I biplane, was the first British airplane home-built and flown at Brooklands in 1908 by its creator. 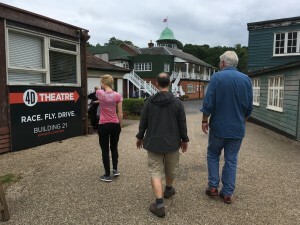 Visiting Brooklands was a marvelous way to beat our jet lag. It turned out to be an excellent off-beat destination to while away an entire afternoon near London – and we didn’t give a thought to being tired. 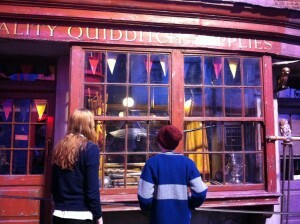 It is possible to peer into the very shop window used in the Harry Potter movies at Warner Brothers Studio in London. “So, I’m a Gryffindor, which house is yours?” asked the blonde-braided girl from Idaho. Her question was directed at our shy thirteen-year-old Harry Potter fan on her first trip to England. In line at King’s Cross Station to visit the magical Platform 9 ¾ with her muggle sister, mother and grandmother, it was a relief to be approached by a kindred spirit. 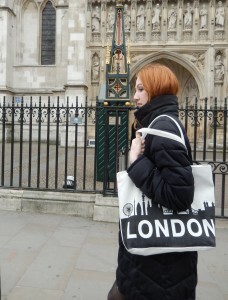 The two fans giddily launched into a discussion of the books and movies that connected them and compared notes about their pilgrimage to London to trace the steps of their favorite characters. In a city that is full of history and rich in personalities both real and imagined, it is fun to visit the places made popular by books and films and then find the secret pockets that may have inspired them. Our journey began with a stop at Warner Brothers Harry Potter studios where the eight now-famous films were shot. The visit was a surprise for our birthday girl who was asleep in the car after a long flight from the United States. When we shook her awake to look around, her eyes grew with delight and her mouth fell open. This was an enchanted place she did not even know existed, and we were all unsure about exactly what to expect. Unlike the recreated Harry Potter World in Orlando with rides and shops, this place is the actual studio where the actors worked and were educated as they made the movies based on J.K. Rowling’s world-renowned novels. Here were the sets, costumes and props that were lovingly designed by craftsmen and artists who worked diligently for up to ___ months on any given scene. This was where we could learn how the giant monsters were made and take a turn with a green screen to fly on a broom. Through audio guides and informative videos we learned countless facts and details. The Gryffindor Common Room set, for example, had flyers on the walls made by the actor/students to set the scene more realistically, and the tomes in Dumbledor’s office are mostly London phone books covered with carefully constructed leather bindings. In several areas of the studios we found out how Hagrid was made to look so gigantic compared to his actor peers, and throughout the tour we used special passport booklets to gather stamps that showed our progress through the exhibits. Our favorite part, however, came at the beginning of our visit when the guide asked if there were any birthdays being celebrated among the guests. Our enthusiast was the only one, and after she made her way to the front of the crowd, she was invited to open the oversized wooden doors to the echoing Great Hall of Hogwarts. As she pushed the heavy doors open, we were treated to a magnificent view of the vast, empty chamber complete with stone floor, fireplace and headmaster’s table ready for incoming students. Authentic costumes from the four houses lined the side walls, and the real sorting hat rested on a platform toward the front of the room. Our guide explained the technical background about how it was made to talk in the movies. In the back lot after a butterbeer and a sandwich, we visited the Knight Bus and the house where Harry had lived with his parents before Voldemort brutally murdered them. Squeezed into the corner of the courtyard is the house on Privet Drive where Harry subsequently lived with his aunt, uncle and cousin before being rescued into an unexpected life of wizadry on his eleventh birthday by the half-giant Hagrid. The rickety and imbalanced suspension bridge from the back side of Hogwarts to its quidditch pitch was open for a few visitors at a time, and we had an opportunity to sit on Hagrid’s motorcycle and in the flying car that Ron and Harry took to school in the second movie when they missed the Hogwart’s Express that left from Platform 9 ¾, the very one we visited later in our visit to London. The rest of the trip revealed its Harry Potter connections like little rare gems that emerged from the cobbled streets of London. It was on a Jack the Ripper walking tour through London’s East End that we found a narrow Victorian alley that we learned was the inspiration and on-site filming location for Diagon Alley. Detailed scenes had been shot at the elaborate movie set we had visited days before, so it was fun to walk the real alley…twice. At Hampton Court Palace on the western edge of London we found the inspiration for the Hogwarts Great Hall. In this so-called Pleasure Palace of Henry VIII, the hall’s ornate ceiling is filled with majestic and intricate details that were carved at the direction of the king and his then-wife, Anne Boleyn. It felt eerily similar there to the hall in which we had stood at the film studios. They even had a table at the front of the hall set for the nobility just as the Hogwarts hall had been set for the teachers’ head table. The tapestries on the great hall walls and grand windows set a scene that felt ready for magic. Also at Hampton Court Palace we found a hedge maze that launched us directly into the fourth Harry Potter movie in which participants in a tri-wizard tournament fight for their lives in exactly such a maze. For £5, we could walk through it and imagine ourselves in competition for the tri-wizard cup, just as Harry Potter had done. Old stone buildings and wrought iron fences make many parts of London feel like a stroll through a Harry Potter novel. Our Potter fan is not a shopper by nature, and she was baffled when we wanted to drag her to a department store, but we assured her this would be worth the trip. She had just asked what the big deal was when we rounded the corner and emerged in front of Liberty, a world famous department store with a 92-year-old, Tudor-styled exterior that looks like it should have featured in the films along Diagon Alley even though it didn’t. Ornate wooden stairs led us to uneven timber floors that connect small rooms and balconies. In one corner, we even found a tiny wooden elevator with intricate carvings that made us all feel like we were whisking floor to floor while shopping for Hogwarts robes or a Yule Ball gown. Even a trip to Covent Garden for dinner before the theater revealed a Harry Potter gem when we wandered into a paper shop that sold quill pens and ink. The clerk pulled out a piece of parchment on which we could test the quills and decide if a feather pen or wooden one would be best for our Hogwarts fan. She decided on a wooden pen with a well of green ink that would replicate the ink used in the first movie on the many acceptance letters that flooded the Privet Drive cottage after Harry’s unkind and wildly non-magical aunt and uncle tried to keep him from knowing about the wizardry school and his place in it. 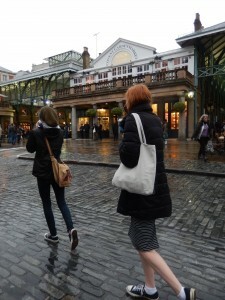 Covent Garden offers creative shops where even a quill for a Hogwarts student can be found. Our Harry Potter tour had been largely unplanned and unexpected; the trip had been more about visiting friends and seeing sights. But the magic that it inspired in each of us was palpable, and the connection it created between fans and travelers was an unforeseen bonus to an already enchanted trip.